The cathedral ceilings of Perimeter Institute’s four-storey atrium will resound with the soaring voices of The Tallis Scholars. 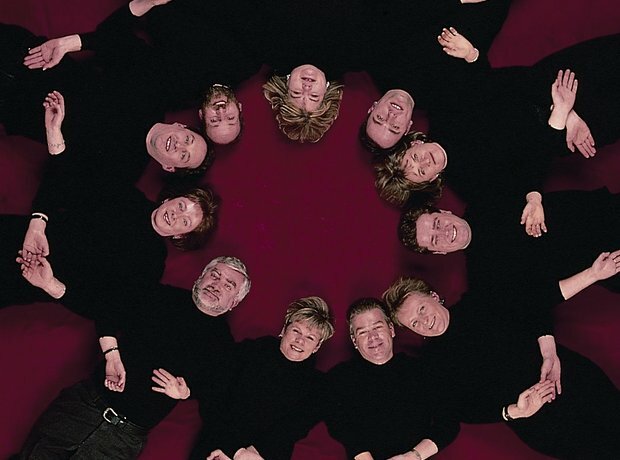 Under the directorship of Peter Phillips, the award-winning vocal ensemble has established itself as the leading exponent of Renaissance sacred music throughout the world. This powerful and evocative experience at Perimeter should not be missed. NOTE: Since this concert will be held in the atrium it will be a General Admission concert. Subscribers will receive the benefit of priority seat selection on the night of the concert. The Tallis Scholars were founded in 1973 by their director, Peter Phillips. Through recordings and concert performances, they have established themselves as the leading exponents of Renaissance sacred music throughout the world. Peter Phillips has worked with the ensemble to create, through good tuning and blend, the purity and clarity of sound which he feels best serve the Renaissance repertoire, allowing every detail of the musical lines to be heard. It is the resulting beauty of sound for which The Tallis Scholars have become so widely renowned. The Tallis Scholars perform in both sacred and secular venues, giving around 70 concerts each year across the globe. In 2012-2013 the group toured the USA twice and Japan once, and visited festivals and venues across the UK and Europe. They continue their association with the Choral at Cadogan series, of which Peter Phillips is Artistic Director, giving two performances in the Hall. The group celebrated their 40th anniversary in 2013 with two commissions from Gabriel Jackson and Eric Whitacre, extensive touring and special CD releases. They also gave a unique celebratory performance of Tallis’ Spem in alium in St Paul’s Cathedral, London on 7 March 2013. The Tallis Scholars' career highlights have included a tour of China in 1999, including two concerts in Beijing; and the privilege of performing in the Sistine Chapel in April 1994 to mark the final stage of the complete restoration of the Michelangelo frescoes, broadcast simultaneously on Italian and Japanese television. They have commissioned many contemporary composers during their history: in 1998 they celebrated their 25th Anniversary with a special concert in London's National Gallery, premiering a Sir John Tavener work written for the group and narrated by Sting. A further performance was given with Sir Paul McCartney in New York in 2000. The Tallis Scholars are broadcast regularly on radio (including performances from the BBC Proms at the Royal Albert Hall in 2007, 2008 and 2011) and have also been featured on the acclaimed ITV programme The Southbank Show. Much of The Tallis Scholars' reputation for their pioneering work has come from their association with Gimell Records, set up by Peter Phillips and Steve Smith in 1980 solely to record the group. In February 1994 Peter Phillips and The Tallis Scholars performed on the 400th anniversary of the death of Palestrina in the Basilica of Santa Maria Maggiore, Rome, where Palestrina had trained as a choirboy and later worked as Maestro di Cappella. The concerts were recorded by Gimell and are available on both CD and DVD. Recordings by The Tallis Scholars have attracted many awards throughout the world. In 1987 their recording of Josquin's Missa La sol fa re mi and Missa Pange lingua received Gramophone magazine's Record of the Year award, the first recording of early music ever to win this coveted award. In 1989 the French magazine Diapason gave two of its critical Diapason d'Or de l'Année awards for the recordings of a mass and motets by Lassus and for Josquin's two masses based on the chanson L'Homme armé. Their recording of Palestrina's Missa Assumpta est Maria and Missa Sicut lilium was awarded Gramophone's Early Music Award in 1991; they received the 1994 Early Music Award for their recording of music by Cipriano de Rore; and the same distinction again in 2005 for their disc of music by John Browne. Released on the 30th anniversary of Gimell Records in March 2010, The Tallis Scholars’ recording of Victoria’s Lamentations of Jeremiah received critical acclaim, and to further celebrate the anniversary, the group released three 4 CD box sets of “The Best of The Tallis Scholars,” one for each decade. The ongoing project to record Josquin’s complete cycle of masses, when completed, will run to nine discs. These accolades and achievements are continuing evidence of the exceptionally high standard maintained by The Tallis Scholars, and of their dedication to one of the great repertoires in Western classical music.